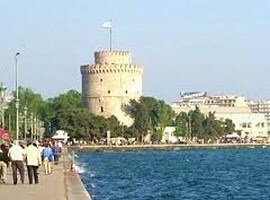 This article is going to be a tour guide of the city of Thessaloniki in which are suggested routes with historical interest. You can find instructive information about the monuments, the archaeological sights and the historical attractions of the city which for years is proclaimed as the ‘’ Cultural Capital of Europe’’. 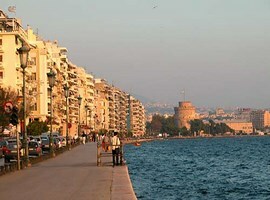 Let’s start this heritage walk in the historic city of Thessaloniki. In 315 BC, Cassander the King of Macedonia, joined up 26 townships in the Thermaikos Gulf, and thus founded a new city for his kingdom which would grow into a large commercial port as well as blossoming economically and culturally. 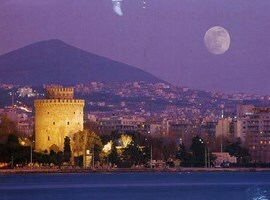 He named the city after his wife, Thessaloniki, daughter of King Philipp ΙΙ and sister of Alexander the Great. 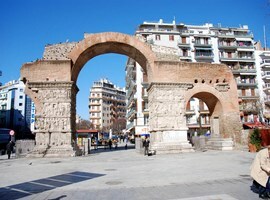 Later, with the Roman conquest of the area, Thessaloniki continued to flourish as a military and trading center for the region, being crossed by the Via Regia, linking the Adriatic Sea with Asia. The city was visited by Paul the Apostle who addressed two brilliant Epistles to the Thessalonians and established there the first great Christian church in Europe. The Romans marked their presence in the city with superb public edifices and a palace bequeathed by Emperor Galerius. During the Byzantine period the city continued to grow, becoming the political, economic and religious hub of the Balkan Peninsula. 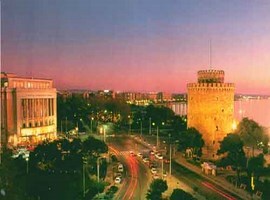 Thessaloniki was adorned by resplendent churches and became a magnet for commerce and arts. Two missionaries from Thessaloniki, Cyril and Methodius spread the word of Christ to the Slavs and by inventing the Cyrillic alphabet made a significant contribution to the Slavs’ cultural development. As Thessaloniki has great strategic significance, the Ottomans turned the city into a military and administrative center of their empire and thus it became the natural gateway into Europe. The city’s strong Greek profile continued undiminished and was the major factor for it and the broad surrounding region being re-united with Greece following its liberation on 26th of October 1912. 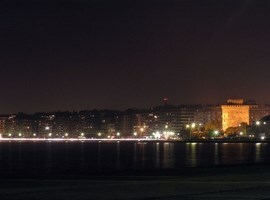 Nowadays as administrative and financial center of northern Greece, Thessaloniki has a population of around one million and is one of the most important cities of the Balkans. 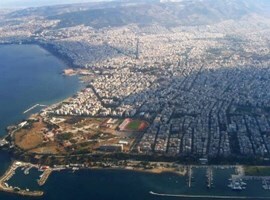 Thessaloniki has the distinction of being a city of uninterrupted urban activity for more than 2,300 years. Over the centuries its strategic position has ensured that it has been one of the most important crossroads for the region as a whole. 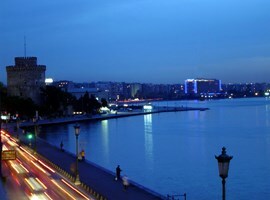 The city is developing rapidly and aims to continue to play a leading role in the Balkans. The welcoming people of Thessaloniki are proud of their city and with their efforts are contributing to its development and prosperity. 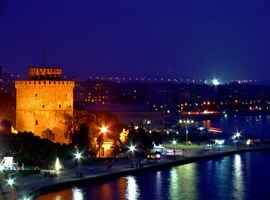 The emblem of Thessaloniki, the White Tower is intimately connected with the city’s history and the focus of many legends reflected in its various names. At the meeting point of the eastern and the sea wall, stood this beautiful Byzantine tower since the late 15th century. The original appellation Fort of Kalamaria (18th century) was replaced in the 19th century by the names Tower of the Janissaries and Tower of Blood (Kanli Kule), referring to the use of the building as a prison for long-term convicts and those sentenced to death, whom the Janissaries executed on the battlements, dyeing with blood the exterior walls of the tower. In 1890, the tower was whitewashed by a convict in exchange for his freedom, and was henceforth known by its current name, the White Tower. As a structure, the tower reflects the characteristic architectural style of the great circular towers of the late 15th and early 16th centuries. The structure was topped by a conical, wooden roof, covered in lead. Until the early 20th century, a polygonal defensive structure survived at the base of the tower, with apertures for cannon at sea level along the sides and small towers serving as look-out points at the corners of the enclosing wall. Inside the White Tower, there is now a museum of the Byzantine culture where visitors can enjoy a digital reconstruction of the city’s history. For the summer season (1st April – 31st October) the museum is open until 20:00pm, 7 days a week. Do not miss the opportunity to visit this cultural diamond and to come back in the past through its history. The area from Koundouriotou str. up to Olympou Diamanti str. (boundary with the Frankish quarter), and from the former Hiou str. to Limnou str. was known during the period of Turkish rule as Istirá which means market (or in Greek agora). Today the area bounded by the streets Koundourioti, Axiou, Averof, Ionos Dragoumi, Edessis, V. Hugo, Tsimiski and Salaminos is what has remained of the port market district, it is known as the Ladadika Quarter and has been designated as protected historic site. In the years of Turkish rule, the same district occupied the area which had once been the site of the Byzantine port of Constantine the Great. This was the trading center of the city for many centuries dealing oil, spices, grain and other products. The catastrophic fire of 1917, which destroyed most of the center of the city, to the east of the Istirá market and the Frankish quarter, spared this part of the market. But a new threat materialized in the shape of the urban plan implemented in 1925 and the subsequent decades, particularly with the widening of Tsimiski and Salaminos streets. Attempts to save the historic character of the Ladadika quarter began in 1985, when it was declared as a protected site of historical interest. refers to it under the names Top-hane (arsenal tower) and Tamba-hane (tanners’ tower). The tower was designed to allow the use of artillery and must have formed part of a program to modernize the city’s fortifications. Various repair and consolidation work was carried out later, the most important project was these of 1741, when the southern part of the wall facing inwards was broadened by 18 meters creating an embankment on which three powder magazines were constructed. This public building dates probably to the late 13th or early 14th century. In the Greco-Roman world, public baths were the feature that distinguished more clearly than any other urban from rural populations. They were centers for social contacts and cultural activity and they retained their character even in the early Christian cities (6th-7th centuries). During the dark ages, most of the public baths were closed, only the private bathhouses remained open. This is why the Thessaloniki’s baths are so special in the Greek world. There were available for the public without interruption until 1940. The Eptapyrgio Fort (means 7 towers) is an adaptation of an earlier Byzantine fort, which underwent modification in 1431, immediately after the Turkish capture in the city. As we learn from the Turkish inscription above the main gate of its central tower, the walls of the tower also incorporate some pieces of sculpture taken from an earlier Byzantine building. The Eptapyrgio took its name as its counterpart in Constantinople, from the seven rectangular towers of which it is composed, together with the curtain wall and the central tower of the gateway creating the shape of the Greek letter Π. At the end of the 19th century, the fort became a prison known with the name Yedi Kule. The prison was totally removed in 1989 and in its place there are the offices of the 9th Ephorate of Byzantine Antiquities. The first Catholic Church of the city was built in 1742 by the Jesuits who in 1783 were succeeded by the Lazarists. The church was burnt in 1839, was rebuilt in 1867 and was destroyed again in 1897. The modern three-ailed basilica church was constructed completely in 1900 by Vitaliano Posseli at the foundations of the earlier church. This section of wall has been uncovered along the axis running from the Vardar Fort to Democracy Square (Vardar), where the city’s main gate to the west the Golden Gate, once stood. This was the starting point for the main road artery of Thessaloniki, the Roman Via Regia or Byzantine Leophoros (avenue), which crossed the city below the level of the modern Egnatia Street. The walls continue beyond Democracy Square, along Eirinis str. and as far as Aghiou Demetrious str., along the axis of which there was another gate in the western walls, the Lytaia Gate. 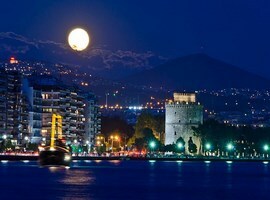 Thanks to its strategic place and its port, Thessaloniki is a timeless hub of trading and culture. The upper information gives only a little taste of the historic value of the city. Even you are a visitor or a local it’s sure that you won’t be bored in this really beautiful place.